PVC (polyvinyl chloride) is the main ingredient in VEKA's compound. This mixture results from a combination of natural gas and rock salt. In its pure state, PVC does not have the qualities associated with VEKA vinyl like durability and weatherability. To increase the performance characteristics of PVC, VEKA adds seven different micro-ingredients to PVC. These seven ingredients, combined with superior methods of blending, differentiate VEKA compound from other extruded vinyl on the market. Ultimately, this difference is passed along to the finished product, installed in homes all over the world. VEKA's micro-ingredients address specific needs of a high quality, durable VEKA vinyl window or door system. Heat Stabilizers minimize the effect of heat (solar radiation) on the vinyl window. Impact Modifiers will strengthen PVC to prevent damage during fabrication, shipping and operation of the window unit. UV Stabilizers will aid in preventing discoloration and fading of vinyl material due to ultraviolet light exposure. Lubricants provide a smooth finish on the vinyl surface frame. Processing Aids help the compound maintain consistency as it changes into a plastic. This ensures consistent quality in the finished product and predictable, consistent fabrication. VEKA uses two different pigments to impart color to our vinyl. One is used depending on the desired result. Almond pigment creates a light beige color while Titanium Dioxide (TiO2) imparts a brilliant white color to the vinyl and helps to reflect the sun's rays from the finished surface. Calcium Carbonate, referred to as a filler, replaces some of the PVC to increase impact and tensile strength to the finished material. 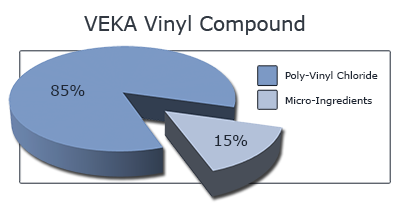 This formulation results in superior vinyl window and door products that will not rot, chip, corrode, peel or blister. VEKA says that studies have shown how vinyl products are more cost effective in comparison to other building products. For example, taking into account installation costs and maintenance for 20 years, a 1996 study found that one three-foot by four-foot wood double-hung window costs about 10 percent more than a vinyl one. That cost is more significant if you consider the average home has 15 windows. VEKA says vinyl is strong, durable and resistant to abrasion and moisture. It also can withstand rust and corrosion, is electrically non-conductive and has good fire performance properties. “Because it is less than half petroleum, vinyl is the most energy-efficient plastic,” the company says. “And because it has been used for more than half century, it is one of the world’s most analyzed and tested materials.” It was originally developed by scientists in the 1920’s, who had no idea at the time that product would amount to so much.